This is the Tamil-English(KJV-NIV) Version Holy Bible Reader app for windows phone. We want to make it easy for you to read and share God's Word. 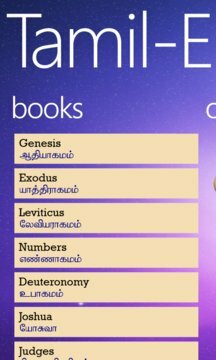 This application offers Tamil-English(KJV-NIV) translation of the Old & New Testament and packaged with handy features such as Favorites, Share verse in social medias, Email, Themes and much more!